Stamporama: Utramar overprint on 1900 Cape stamp? 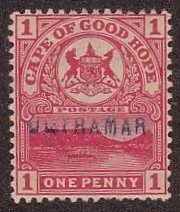 Utramar overprint on 1900 Cape stamp? What is the link between old Spanish colonies in the Carribean and the Cape Province, if there is any? I found this unusual overprint on a Cape of Good Hope stamp, which was quite a challenge to find out what is was. I have seen the word Ultramar being used on Spanish Colony stamps for their territories in the Carribean, such as Cuba. The Cape Province never was Spanish, initially a Dutch colony owned by the VOC (Dutch United East Indies Company) and later was taken over by the British after the French invasion of the Netherlands end of the 18th century/beginning 19th century. After some reseach and the help of fellow collectors it became apparent that it is actually a Specimen print, overprinted by Portugal. When Portugal joined the UPU in 1880, they received reference copies of stamps from all other UPU members. This is the reason why so many countries have reprints in that period. UPU members however did not just send stamps to the UPU, but also postal stationary and prints from franking machines for verification purposes. This was in small amounts though, for instance the Fuji one penny purple issue from 1926 only 421 copies were overprinted with SPECIMEN.